Dummy has been a bit miffed since Christmas. You would think after all we’ve been through together he wouldn’t mind having a felt Santa hat stuck to his head. Sure it took a few weeks of having towels soaked in lemon oil wrapped on his head to get the glue off but still, what’s a little glue between friends. Besides he now has a lovely lemon oil sheen to him, he should thank me! Nevertheless, I decided to really go for a nice photo outdoor photo spread to make him happy. 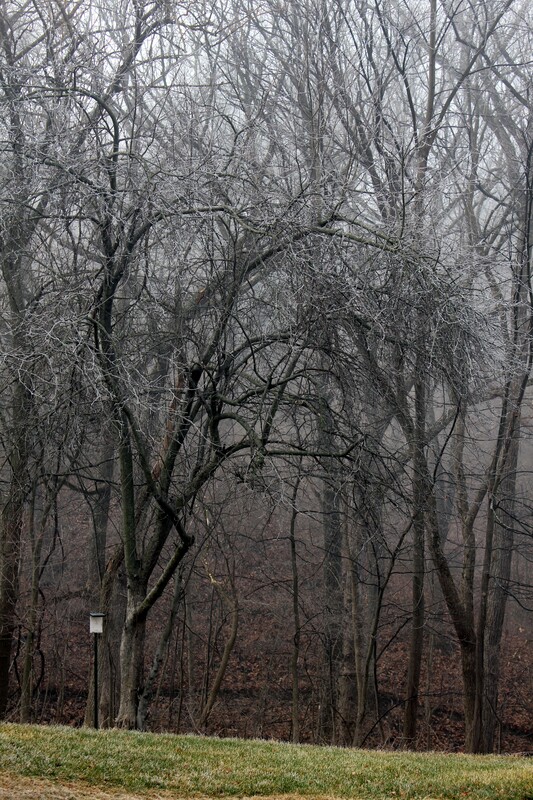 Unfortunately Mother Nature is intent on making my backyard look as creepy as possible..
Fog and frost, brrrrr. Doesn’t it look like a zombie or a rabid yeti is about to come stumbling out? It was an odd frost too. It was coming off in strings and floating to the ground. Four hours later with tape in my hair and glue on my shirt awash in a sea of cardboard shavings I finally finished. Dummy inspected the box, made a few ho hums and decided he needed to get into a little set design. He couldn’t fool me, he was happy. I have been trying my hand at making some jewelry in the last week and he went hog wild among the beads. 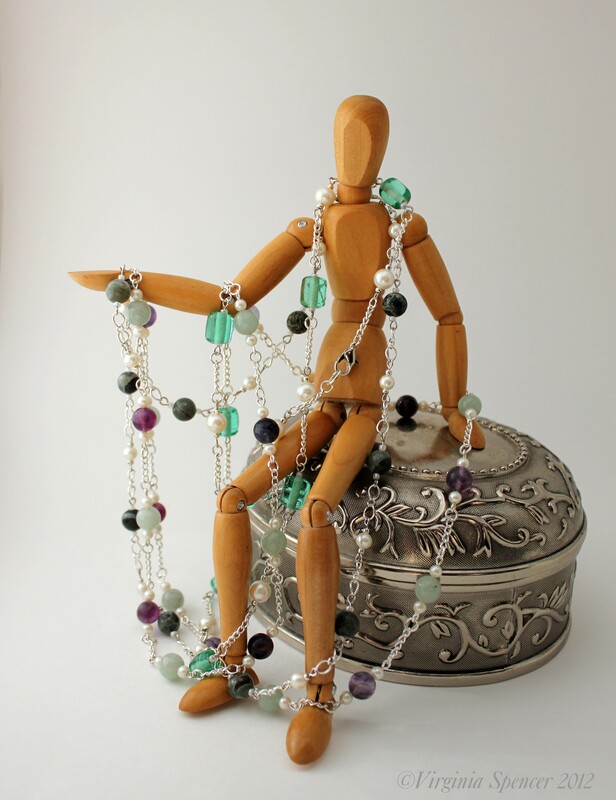 He is wearing a moss jasper and cultured pearl necklace, a hand blown green glass and cultured pearl necklace and an aventurine, purple quartz, and cultured pearl necklace all with silver chains. < Previous Happy Groundhog Day! I especially love the second photo. There’s a peacefulness about it, even in its cold. You’re a jewelry maker too? Nice work. Dummy’s ready for high fashion magazines. 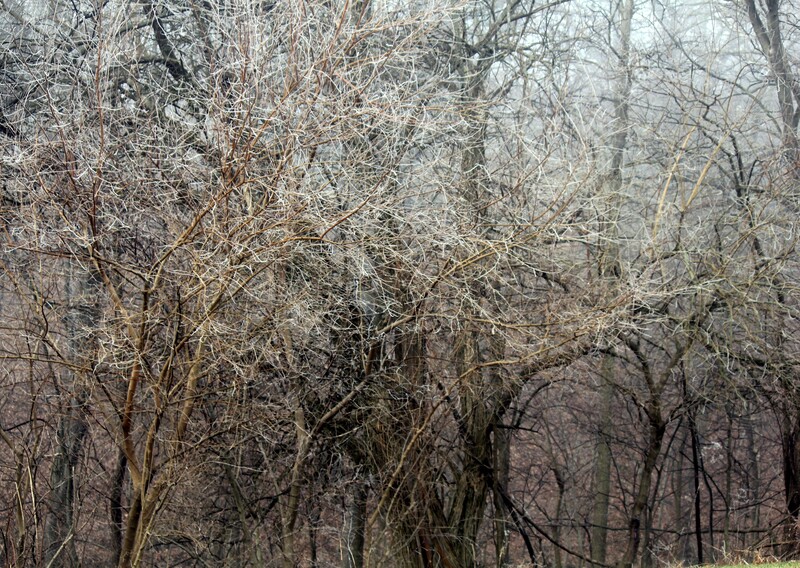 Thank you, it is was an odd day, I’ve never seen frost like that. It was very peaceful until a police siren was heard in the distance and all the turkeys decided to yell about it. They are a noisy bunch. I’ve only made these necklaces and some earrings so far. I couldn’t find any I like so I figured I would try it out. I’m enjoying it. I’m still working on trying to figure out all the stuff on my camera, I took photography classes years and years ago with a manual 35mm camera but I need to refresh my mind on all the technical stuff. Why were you so mean and glued Dummy’s hat on??? Double sided tape or play doh may have worked. The poor thing. I love your creepy backyard. It’s almost like you ARE waiting for something creepy to appear, like a paranormal sighting. Lol, I would run at the first sight! I did use the double sided, but it melted to his head, that was a mess. I think he was too dry. He’s all oiled up now and looking lovely. Dummy looks like all is forgiven now! And so he ought- your jewellry is really pretty! LOOOOOVE your trees, these photos are spectacular! I love frost on things (preferably outside things and not inside because you-know-who is being stingy with the heating), and whenever it frosts I go running out in my pyjamas to take photos! Everyone’s used to it now, they hardly notice!! I love the frost too We normally have snow and bitter temps at this time of year, but it’s been such an odd winter. Mother Nature is concentrating on Europe this year! One of the joys of a La Nina Effect year, we get super fun weather in winter. Love the shots of your yard, we could have shot a horror film there. Lol, it would be a good indy film spot. I could picture it now, It could start with a scene of Misty (in those white boots, I love those boots) running through the trees and then go to a shot of Dummy with a butcher knife..I would love to see my neighbor’s expressions. They’re all very nice, really really nice but they’re a staid bunch. The link is Lightbox. It’s pretty good. The post office has those boxes for free, if you need one.